Let’s face it, with the accessibility of robotic automation, and the unreliable and unpredictable workforce nowadays, it doesn’t make sense not to automate your process. The robotics landscape has seen significant change in recent years with the welcome arrival of collaborative robots (cobots), allowing for flexible, mobile and modular possibilities. By investing in cobot integration, factories can spend less money automating a system and earn quick returns by eliminating unnecessary downtime. Now, machine builder and robotics integrator Allied Technology has taken the next step forward, once more reducing unnecessary costs associated with integrating robots; During his 30 years designing and building custom machinery, Allied Technology’s founder Mike Halley had a vision to create flexible, modular robot cells that can easily be implemented and redeployed when necessary. 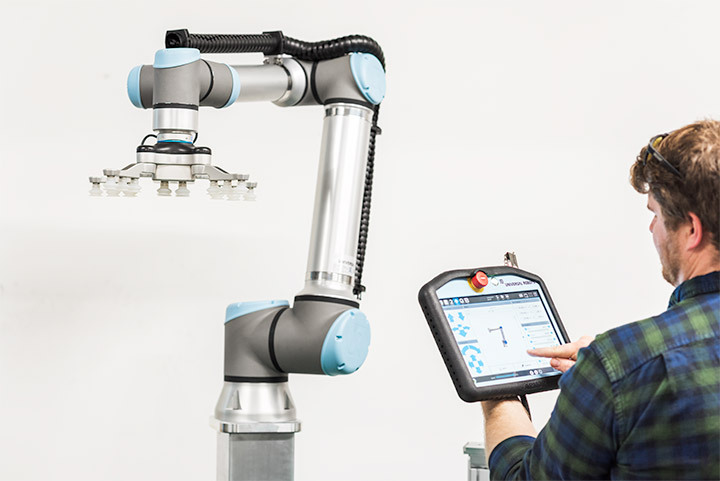 Universal Robots’ new e-Series cobots have given Allied Technology even more flexibility as they develop their new robot cells and other innovative solutions. Since mainstream collaborative robots first entered the U.S. market in 2012, Allied Technology has been researching and developing innovative solutions for the growing cobot industry. Finally, they have an answer to recurring requests for the modern automation landscape. What they are offering is a variety of robot “cells” that require minimal modifications to suit any specific application. Their in-house machining and prototyping affords them the ability to make the exact adjustments to a given project quickly and of high quality, while eliminating the extraneous costs and time of outsourcing these processes. Allied’s robot programming is very straightforward and robust so making alterations can be as simple as re-teaching waypoints, which are possible for operators and managers to complete if necessary. Their cobot and automation solutions are designed to be modular, scalable, flexible and easily redeployed for future needs. This means any system purchased now, can be reused as products and production lines change in the future. Allied Technology introduces their new Modular Collaborative Robot Palletizer. Robot integration for a long time was very expensive, and understandably so. A team of experienced engineers was needed to correctly integrate robots into a facility and bring complex automation equipment together safely. With the successful introduction of cobots in the last few years, the cost to automate has been reduced and ease of use has been dramatically improved. Allied’s modular robotic cells, such as their new Modular Cobot Palletizer (hyperlink to video), is making automation easier than ever before. The collaborative robot palletizing system is a mobile, modular and incredibly affordable palletizing solution to meet the current and future demands for the packaging industry. It features multi-pick capabilities, horizontal cross slide and vertical lift column to extend the robot’s reach, and versatility of handling small to large case sizes. To get automated with Allied Technology and learn more about the innovative robot cells they offer, visit Allied-Technology.com. Working together, their team of engineers will help you ease into automation. Ready for an e-Series demo? Request one now! Matt Halley is General Manager and leads the Research and Development team for Allied Technology . 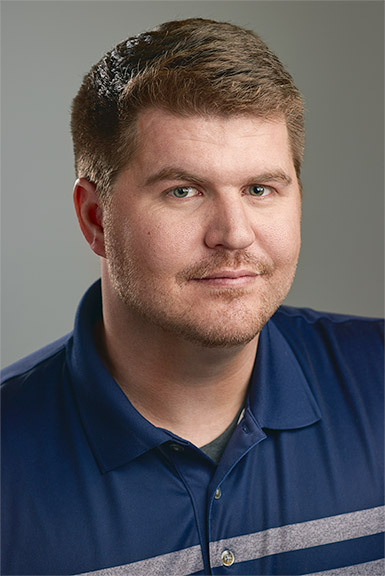 With 10 years of experience in custom machine building and robotic integration, Matt is well rounded with positions in manufacturing, mechanical design, project management and operations. Since 2013, he has been working with collaborative robots (cobots) and developing a new line of flexible robotic cells to help companies ease into collaborative robot automation.